All-new for 2009, the Toyota Corolla slightly grows in size and interior space. Powered by either the standard 1.8l 4-cyl. or the 2.4l 4-cyl. in the top-of-the-line XRS, the Corolla hosts five passengers in a comfortable and save interior that's protected by front, side, and side-curtain airbags. With five equipment levels, there's a Corolla for everyone. 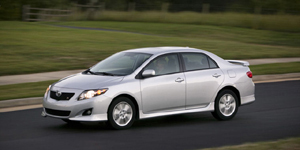 The 2009 Toyota Corolla Sedan is powered by a base 1.8-liter Inline-4 with 132 hp. Also available is a 2.4-liter Inline-4 with 158 hp.